Sept. 25 2015 - During the last months, Extra has been the reliable technological partner of "Regione Autonoma della Sardegna" (Govermnent of Sardinia) for the project "Sardegna Turismo Evoluzione" concerning the integration of the touristic facilities. Later for the same project, Extra, as a partner of Pentaho for a long time, has been titled with an Honorable Mention at Pentaho Excellence Awards 2015. The project was related to the realization of a complex technological infrastructure based on Open Source solutions, with the aim to obtain an "Open, Standard and Federated Information System for managing the information related to the offer and the demand of touristic services in Sardinia, including a system for analyzing these information"; this system should also integrate with the touristic technological platform. Building a decision support system (DSS) upon the collected information to help the government's managers in building marketing campaigns to promote the tourism industry (special offers for families, archeological tours, fishing tournaments, etc.) and identifying irregular facilities. Data storage (Mongo): solves the problem of vertical and horizontal variation of data and make the system ready to face the growth of information due to historicization of the facilities’ information over years. Middleware (Fabric8, the Community Edition of JBoss Fuse): used to route the information from data sources to MongoDB. It implements the transparent proxy to guarantee backwards compatibility with the existing interfaces to collect information from the facilities. It also exposes new web services to collect new information previously sent with paper documents and the CRUD (Create, Read, Update, Delete) interface used by all the other sub-systems to access the data stored in MongoDB. This helps avoid replication of the rules used to store the information in Mongo collections and to translate them from a relational format to a semi structured one. 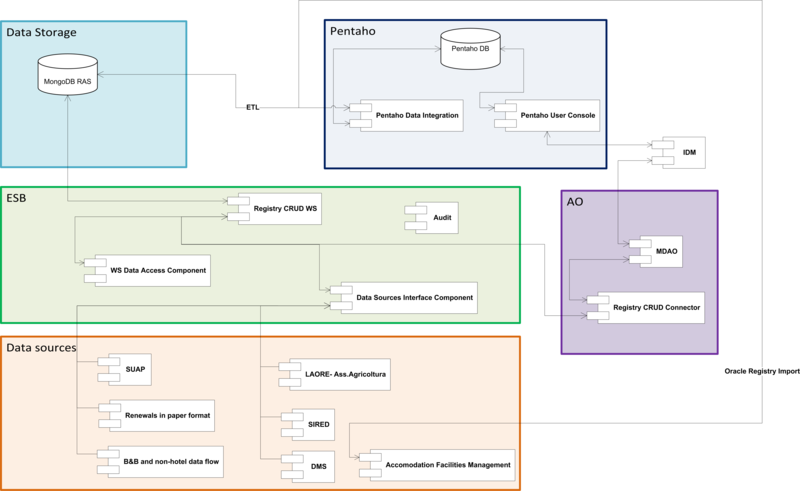 ETL and reporting (Pentaho Business Analytics Suite): we used PDI for the initial bulk loading and data cleaning of the information extracted from Oracle. PDI is also used for every day data mart feeding. Saiku is used for dynamic data mart querying, CDF for geo-localization and map report creation, PRD to create document-like reports. Operator area (DRUPAL): GUI webapp used by various operators for CRUD operations (through the CRUD module exposed by of Fabric8). Powerful dynamic web forms to manage vertical/horizontal data variations.